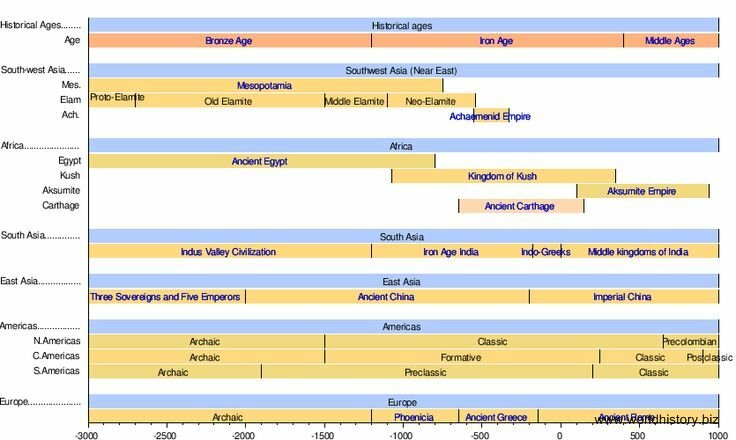 For earlier events, see Timeline of human prehistory. The Bronze Age refers to a period in human cultural development when the most advanced metalworking (at least in systematic and widespread use) included techniques for smelting copper and tin from naturally-occurring outcroppings of copper ores, and then smelting those ores to cast bronze. These naturally-occurring ores typically included arsenic as a common impurity. Copper/tin ores are rare, as reflected in the fact that there were no tin bronzes in western Asia before 3000 BC. In some parts of the world, a Copper Age follows the Neolithic and precedes the Bronze Age. The Iron Age was the stage in the development of any people in which tools and weapons whose main ingredient was iron were prominent. The adoption of this material coincided with other changes in some past societies often including differing agricultural practices, religious beliefs and artistic styles, although this was not always the case. 3300 BC: Hakra Phase of the Indus Valley Civilization begins in the Indian Sub-continent. c. 3000 BC: Sumerian cuneiform writing system. c. 3000 BC: Stonehenge construction begins. In its first version, it consisted of a circular ditch and bank, with 56 wooden posts. 2600 BC: Oldest known surviving literature: Sumerian texts from Abu Salabikh, including the Instructions of Shuruppak and the Kesh temple hymn. 2560 BC: King Khufu completes the Great Pyramid of Giza. 2500 BC: The mammoth goes extinct. 2200 -2100 BC: 4.2 kiloyear event: a severe aridification phase, likely connected to a Bond event, which was registered throughout most North Africa, Middle East and continental North America. Related droughts very likely caused the collapse of the Old Kingdom in Egypt and of the Akkadian Empire in Mesopotamia. 2200 BC: completion of Stonehenge. 1600 BC: Minoan civilization on Crete is destroyed by the Minoan eruption of Santorini island. 1200-1150 BC: Bronze Age collapse in Southwestern Asia and in the Eastern Merranean region. This period is also the setting of the Iliad and the Odyssey epic poems (which were composed about four centuries later). 1100 BC: Use of Iron spreads. Classical antiquity is a broad term for a long period of cultural history centered on the Merranean Sea, comprising the interlocking civilizations of Ancient Greece and Ancient Rome. It refers to the timeframe of Ancient Greece and Ancient Rome. Ancient history includes the recorded Greek history beginning in about 776 BC (First Olympiad). This coincides roughly with the traditional date of the founding of Rome in 753 BC and the beginning of the history of Rome. 776 BC: First recorded Olympic Games. 745 BC: Tiglath-Pileser III becomes the new king of Assyria. With time he conquers neighboring countries and turns Assyria into an empire. 728 BC: Rise of the Median Empire. 722 BC: Spring and Autumn Period begins in China; Zhou Dynasty's power is diminishing; the era of the Hundred Schools of Thought. 700 BC: the construction of Marib Dam in Arabia Felix. 660 BC: purported date of the accession of Jimmu, the mythical first Emperor of Japan. 653 BC: Rise of Persian Empire. 612 BC: An alliance between the Babylonians, Medes, and Scythians succeeds in destroying Nineveh and causing subsequent fall of the Assyrian empire. 600 BC: Sixteen Maha Janapadas ("Great Realms" or "Great Kingdoms") emerge in India. 600 BC: Evidence of writing system appear in Oaxaca used by the Zapotec civilization. c. 600 BC: Pandyan kingdom in South India. 586 BC: Destruction of the First Temple in Jerusalem (Solomon's Temple) by the Babylonians. 563 BC: Siddhartha Gautama (Buddha), founder of Buddhism is born as a prince of the Shakya tribe, which ruled parts of Magadha, one of the Maha Janapadas. 551 BC: Confucius, founder of Confucianism, is born. 550 BC: Foundation of the Persian Empire by Cyrus the Great. 549 BC: Mahavira, founder of Jainism is born. 546 BC: Cyrus the Great overthrows Croesus King of Lydia. 539 BC: The Fall of the Babylonian Empire and liberation of the Jews by Cyrus the Great. 525 BC: Cambyses II of Persia conquers Egypt. c. 512 BC: Darius I (Darius the Great) of Persia, subjugates eastern Thrace, Macedonia submits voluntarily, and annexes Libya, Persian Empire at largest extent. 509 BC: Expulsion of the last King of Rome, founding of Roman Republic (traditional date). 499 BC: King Aristagoras of Miletus incites all of Hellenic Asia Minor to rebel against the Persian Empire, beginning the Greco-Persian Wars. 458 BC: The Oresteia by Aeschylus, the only surviving trilogy of ancient Greek plays, is performed. 449 BC: The Greco-Persian Wars end. 331 BC: Alexander the Great defeats Darius III of Persia in the Battle of Gaugamela, completing his conquest of Persia. 323 BC: Death of Alexander the Great at Babylon. 305 BC: Chandragupta Maurya seizes the satrapies of Paropanisadai (Kabul), Aria (Herat), Arachosia (Qanadahar) and Gedrosia (Baluchistan)from Seleucus I Nicator, the Macedonian satrap of Babylonia, in return for 500 elephants. 300 BC: Construction of the world's largest pyramid, the Great Pyramid of Cholula, begins in Cholula, Puebla, Mexico. 207 BC: Kingdom of Nan Yueh extends from North Việt Nam to Canton. 206 BC: Han Dynasty established in China, after the death of Qin Shi Huang; China in this period officially becomes a Confucian state and opens trading connections with the West, i.e. the Silk Road. 202 BC: Scipio Africanus defeats Hannibal at Battle of Zama. 200 BC: El Mirador, largest early Maya city, flourishes. c. 200 BC: Chera dynasty in South India. 149-146 BC: Third Punic War between Rome and Carthage. War ends with the complete destruction of Carthage, allowing Rome to conquer modern day Tunisia and Libya. 129 BC: Roman conquest of Turkey. 121 BC: Roman armies enter Gaul for the first time. 80 BC: The city of Florence is founded. 49 BC: Roman Civil War between Julius Caesar and Pompey the Great. 44 BC: Julius Caesar murdered by Marcus Brutus and others; End of Roman Republic; beginning of Roman Empire. 40 BC: Roman conquest of Egypt. 18 BC: Three Kingdoms period begins in Korea. 6 BC: Earliest theorized date for birth of Jesus of Nazareth. 4 BC: Widely accepted date (Ussher) for birth of Jesus Christ. 14: Death of Emperor Augustus (Octavian), ascension of his son Tiberius to the throne. 24: The temple of Jerusalem is reconstructed. 26-34: Crucifixion of Jesus Christ, exact date unknown. 37: Death of Emperor Tiberius, ascension of his nephew Caligula to the throne. 41: Emperor Caligula is assassinated by the Roman senate. His uncle Claudius succeeds him. 43: Rome enters Britain for the first time. 54: Emperor Claudius dies and is succeeded by his grand nephew Nero. 68: Emperor Nero commits suicide, prompting the Year of the four emperors in Rome. 79: Destruction of Pompeii by the volcano Vesuvius. 98: After a two-year rule, Emperor Nerva dies of natural causes, his adopted son Trajan succeeds him. 106-117: Roman Empire at largest extent under Emperor Trajan after having conquered modern-day Romania, Iraq and Armenia. 117: Trajan dies of natural causes. His adopted son Hadrian succeeds him. Hadrian pulls out of Iraq and Armenia. 126: Hadrian completes the Pantheon in Rome. 138: Hadrian dies of natural causes. His adopted son Antoninus Pius succeeds him. 161: Death of Antoninus Pius. His rule was the only one in which Rome did not fight in a war. 192: Kingdom of Champa in Central Việt Nam. 200s: The Buddhist Srivijaya Empire established in Maritime Southeast Asia. 226: Fall of the Parthian Empire and Rise of the Sassanian Empire. 285: Diocletian becomes emperor of Rome and splits the Roman Empire into Eastern and Western Empires. 285: Diocletian begins a large-scale persecution of Christians. 292: The capital of the Roman empire is officially moved from Rome to Mediolanum (modern day Milan). 313: Edict of Milan declared that the Roman Empire would tolerate all forms of religious worship. 325: Constantine I organizes the First Council of Nicaea. 330: Constantinople is officially named and becomes the capital of the eastern Roman Empire. 335: Samudragupta becomes the emperor of the Gupta empire. 337: Emperor Constantine I dies, leaving his sons Constantius II, Constans I, and Constantine II as the emperors of the Roman empire. 350: Constantius II is left sole emperor with the death of his two brothers. 361: Constantius II dies, his cousin Julian succeeds him. 378: Battle of Adrianople, Roman army is defeated by the Germanic tribes. 380: Roman Emperor Theodosius I declares the Arian faith of Christianity heretical. 395: Theodosius I outlaws all religions other than Catholic Christianity. 406: Romans are expelled from Britain. 407-409: Visigoths and other Germanic tribes cross into Roman-Gaul for the first time. 410: Visigoths sacks Rome for the first time since 390 BC. 415: Germanic tribes enter Spain. 439: Vandals have conquered the land stretching from Morocco to Tunisia by this time. 455: Vandals sack Rome, capture Sicily and Sardinia. 476: Romulus Augustus, last Western Roman Emperor is forced to abdicate by Odoacer, a chieftain of the Germanic Heruli; Odoacer returns the imperial regalia to Eastern Roman Emperor Zeno in Constantinople in return for the title of dux of Italy; most frequently cited date for the end of ancient history. The date used as the end of the ancient era is arbitrary. The transition period from Classical Antiquity to the Early Middle Ages is known as Late Antiquity. Late Antiquity is a periodization used by historians to describe the transitional centuries from Classical Antiquity to the Middle Ages, in both mainland Europe and the Merranean world: generally from the end of the Roman Empire's Crisis of the Third Century (c. AD 284) to the Islamic conquests and the re-organization of the Byzantine Empire under Heraclius. The Early Middle Ages are a period in the history of Europe following the fall of the Western Roman Empire spanning roughly five centuries from AD 500 to 1000. 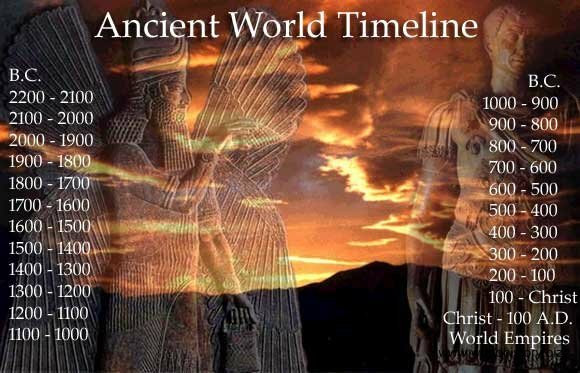 Not all historians agree on the ending dates of ancient history, which frequently falls somewhere in the 5th, 6th, or 7th century. Western scholars usually date the end of ancient history with the fall of Rome in AD 476, the death of the emperor Justinian I in AD 565, or the coming of Islam in AD 632 as the end of ancient European history. For later events, see Timeline of mediaeval history. Kinzl, Konrad H. (1998). Directory of Ancient Historians in the USA, 2nd ed. Claremont, Calif.: Regina Books. ISBN 0-941690-87-3. Web ion is constantly updated. Kristiansen, Kristian; Larsson, Thomas B. (2005). "The Rise of Bronze Age Society". Cambridge University Press. Libourel, Jan (1973). "A Battle of Uncertain Outcome in the Second Samnite War". American Journal of Philogy 94 (1): 71. doi:10.2307/294039. Retrieved September 2007.